Since my high school job as a paste-up artist for a local newspaper, I knew that printing and I would be life-long friends. The smell of ink, the feel of a cold press sheet in my hands and the rhythmic “ka-chunk” keep me coming back for more. After two decades of designing for print I decided it was time to get out from behind the computer and to start doing the printing. In 2011, I purchased my first printing press. With some help from Letterpress Things‘ John Barrett we were able to identify the press as a Damon and Peets 6×10 Treadle Press (Favorite). Manufactured in New York City between 1880 & 1890, the history of this press is fascinating. In the summer of 2012 I joined the artist community at Western Avenue Studios in Lowell, MA. Since then I have opened my doors for young and old, to experience my working Victorian era press first hand. I work primarily with salvaged lead type and lead blocks; hand-setting type the way it was done when my press was first forged. I create custom designed stationery, invitations, and gifts and my work can be viewed and purchased the first Saturday of every month at the Western Avenue Open Studios, Lowell MA. 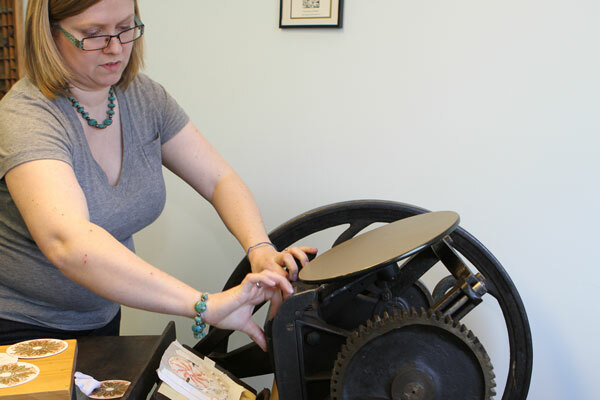 I also offer small studio workshops and private instruction for those interested in learning the history and art of letterpress printing.